Getting people talking about mental health, sharing experiences and removing stigma. 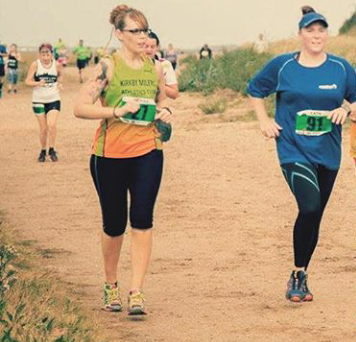 I started running in February 2015 after a friend talked me into doing a 5k route with her as a pick me up and in the hope of getting into shape after a break up. In the following August I joined the Kirkby Milers. It was my 8th year of struggling with my mental health and finding myself coming up against one brick wall after another. Be it not feeling I was getting the help and support I needed, or holding myself back due to a lack of confidence. Through running and the support of the club my confidence has improved beyond what I would have imagined possible. For the first time I'm finding myself openly talking about my mental health and encouraging others to talk about their own experiences and what they have done or can do to help manage in a positive way. Since taking on the role of mental health ambassador in October 2016 I have also completed a leadership in running course. My goal is to make those struggling aware of the benefits of running to our mental and physical health and to have open and honest discussions about mental health. Together we can end the stigma associated to mental health. One in four of us will have a mental health issue at some point in our lives and most of us go through times when we feel down or blue. By joining together we can break the silence that often surrounds mental health and show that talking about this once taboo issue doesn't need to be difficult. So we would like to encourage members to #runandtalk, to get out for a run with a friend and to just have a natter.